A couple of weeks ago, I was a stressing out that Christmas was so close, and nothing had been prepared. Now, with just three days ago, I can assure you that it took us very little time to get everything ready. The Christmas tree is up since last weekend. Husband and I went out on 2 or 3 days to buy presents. Instead of a turkey, I bought a big chicken for Christmas lunch, as it is only the four of us and a couple of friends. I downloaded a nice selection of Christmas songs: the classics sung by Frank Sinatra, Doris Day, Elvis Presley, Boney M. Not some choir that puts you to sleep while listening to it. I baked several batches of last year's tested and approved Christmas cookies. I even baked a few Christmas cakes. No concoctions of my own this year, but other blogger's Christmas cakes. I already shared my Gingerbread Bundt Cake with you, which is so good that I brought it as a gift when we were at friends for dinner. Now here the other cake. I promise, I have only been baking these two cakes, because they are so good. 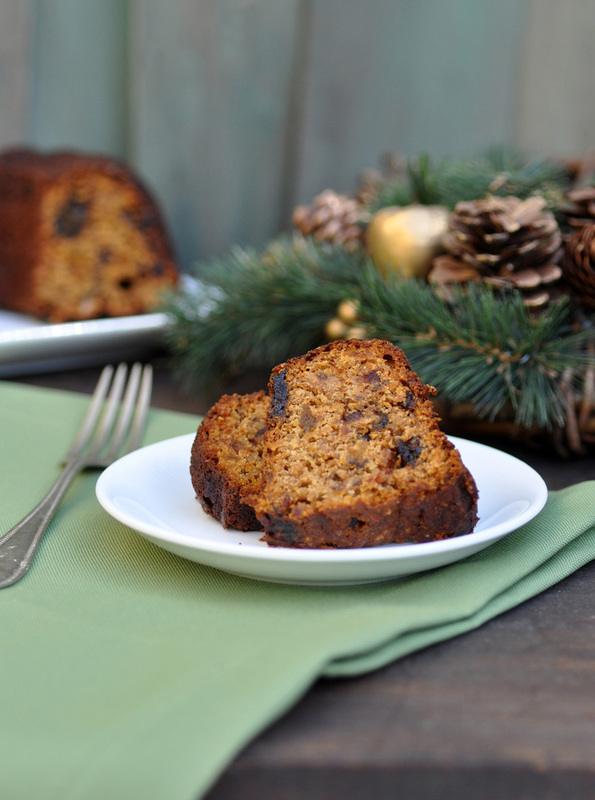 This one is gluten free, with just a little bit of added sugar as the deep dark flavors of the added dried fruit do all the talking in this cake. The ingredients list of this cake is long, but it looks more complicated than it actually is. Only a few days to go until Christmas. Not much time for experiments. This cake will not fail you. Easy to make and the kind of cake that everyone enjoys over the festive season. Place the chopped fruit in a shallow bowl and pour over the brandy or orange juice. Leave to soak for at least three hours. If you want a strong brandy flavor, it is advisable to leave them soaked overnight. Stir occasionally. Preheat oven to 160C/320F. Grease 20cm/8inch cake tin or bundt cake tin. In a large bowl, sift together buckwheat flour and almond meal, salt, baking powder and spices. Set aside. Cream butter and sugar. Lightly whisk the eggs. Combine all in one bowl and stir in orange peel, soaked dried fruit, grated apple and vanilla extract. Pour batter into prepared cake tin, level the surface. Bake for 1 1/2 to 2 hours, until cake tester comes out clean. Let cool a little before taking it out of the tin. Best eaten warm.